Most years I adore Christmas. I love the decorating, the cookies, finding the perfect gift for a special someone. But not this year. Not only have I found myself participating in a murder investigation, I managed to sprain my ankle. But with so much to do, I couldn't let that slow me down. No matter what you might have heard at the general store, I'm sure it was wildly exaggerated. Here's what really happened when the case led the fire marshal's investigator, Hugh, and me to Chris and Trina's house. A twelve-foot inflatable Santa waggled in the wind in front of Chris and Trina's house. Another Santa and the reindeer parked on the roof. In fact, every square inch of the front lawn lit up, moved or blared music. The only thing missing was a path shoveled to the front door. "I think you should wait for me," Hugh said. "I'm fine. I've gotten used to these things by now." I confidently swung my crutches across the crusty snow. I squeezed between a hard plastic camel and an oversized elf. "See?" As I bore my weight down on the crutches, they punched through the crust on the snow. The top of my body lurched forward as my feet slipped out behind me. I whacked the elf with a crutch. He toppled onto Mrs. Claus in a manner that was sure to get him fired. She in turn knocked over Frosty, who leveled the Grinch. Before I could stop myself, I upended the manger and sent Baby Jesus skittering into the street just in time to be crushed under the tire of Ray's police car. Ray flipped on his lights and got out to inspect the scene. The commotion brought Trina to the front door. Her two kids, Krystal and Kyle, peeked out around her. Krystal started to wail. Ray poked the crushed Christ Child replica with his boot. It was doubtful this doll could be resurrected. "Would you like to file a complaint?" he called to Trina. "Looks like assault and battery to me. It might even be a hate crime." Readers, have you ever had a holiday mishap or misunderstanding? Have you had holiday plans pushed aside by a crisis? 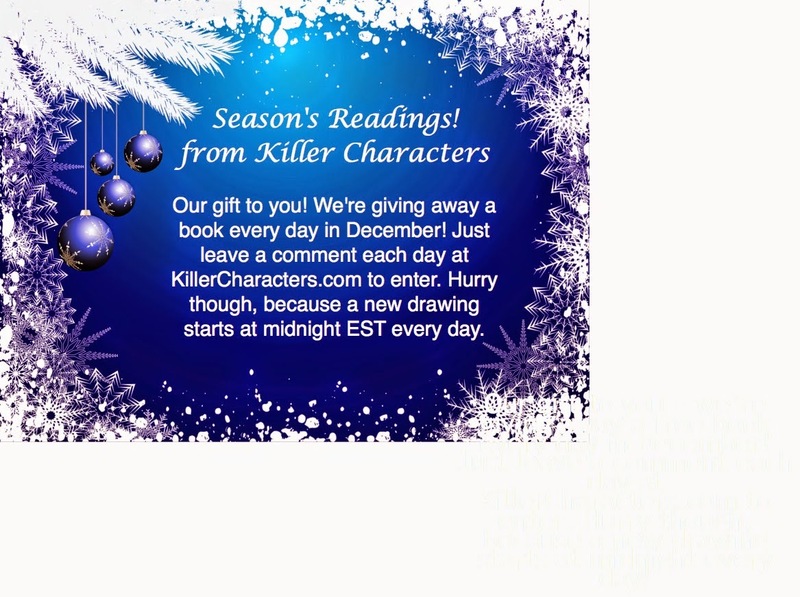 Leave a comment by midnight EST tonight to enter the Seasons Readings Contest. One lucky winner will win a copy of one of Jessie's books. She sounds as clutzy as me. I haven't managed to knock over a town Christmas display, though. We haven't had any problems other than weather or a sick kid. I've been fortunate in that things have always gone well over the holiday season here (and please, may that continue!)! One Christmas eve, I wasn't feeling very well so after I put the turkey in the oven to cook and bring to my inlaws house the next day, I went back to bed and my husband went out with friends to take their children to see the lights at Brennan's horse farm in the area (they decorated the property with lights throughout the farm and even had a working calliope playing Christmas music and you could drive through in your car). When he came back later, he brings the turkey in the bedroom to me and asks if it was done enough. Seems I had the stomach flu so you can imagine what that smell up close did! My oldest sister would say her Christmas was ruined the year I was born. I was born on Christmas Eve day so my mom was in the hospital over Christmas. Another Christmas Day, I was not feeling well. It was my first Christmas with my husband. Turns out it was morning sickness, so that turned out to be exciting! I can understand the problems he is having with the crutches. I was in a serious car accident and was on crutches for several months. I'm a klutz at any time but it was terrible when I was trying to control 4 "legs". It was at Christmas time so we didn't put up the tree or have a lot of decorations because mom wasn't able to get around to do the work. Miserable time. but everything worked out. "Looks like assault and battery to me. It might even be a hate crime." Gwen, you certainly had a misfortune there, knocking over the town's Christmas display! Which is understandable in snowy weather. lol Thanks for the contest. monstercreed@yahoo.com. I've been lucky I guess because I can't think of any mishaps. Cut off from home by storm and forced to spend Christmas in motel with strangers. Learned how gracious people stranded together can be during any mishap brought on by weather. Everyone shared and I made some new friends. Oh yes, what's a holiday without a mishap. One year my daughter stood a little too close to the burning candle on the mantle and caught her hair on fire. Put it out right away, but she did not think it was nearly as funny as her brother did. And the first year I was helping to decorate the altar in church. Tripped, bumped into it, almost knocked it over. Pastor did not think that was funny, either. This year I have a broken foot. No crutches, but the BIG boot. Can be a little awkward when I start rocking on the big heel. No major holiday mess up for me. Would make a great Holiday gift. For me of course! It's the mishaps and mistakes that make the fun and laughter at Christmas. This sounds like a great story already - would love to read one of your books as I have not yet done so. I can't remember any oopsies but I'm sure there are some! Haven't had any mishaps. Books sound great. Fortunately, we haven't had any major mishaps at Christmas. Would love to win. robertscm01@comcast.net. After 10 years of living in Texas I moved back to western New York (this was in 2001). Although I would be working Christmas Day, at least I was closer to my parents and could finally celebrate with them, if not on the date near. Mother Nature had different ideas. There was a major storm and I wasn't able to get from Rochester to Buffalo till the middle of January! Weather, snow , ice etc. Seems like it happens every Christmas. I don't travel for the holidays so that's not an issue. Our refrigerator isn't working well and we'll have to get it fixed soon. It's terrible when your frozen food isn't frozen! Guess I won't be making a pumpkin pie for Christmas. Once I broke some glass ornaments when I was taking them out of or putting them into an ornament storage tub. The dividers didn't work so well so I think that's why they got broken. My husband and I did have one real mishap...our stove quit on Christmas Day. Not much you can do about that, but luckily we always have our big dinner on Christmas Eve, so the leftovers were able to be heated in the microwave. It just wouldn't be the holidays without someone in my family having a crisis. This story sounds like a great read...Thanks for the contest! Merry Christmas! We once had 20" of snow the day of a Christmas party. No one wanted to brave the weather to come, so my family lived on leftover party food for at least 10 days! Being nine months pregnant and ordered by the doctor not to travel more than 15 minutes from the hospital left my husband and me up in the air. As if turned out my parents brought Christmas dinner to us. This was such a blessing. When they left my husband and I decided to take a walk around the trailer park across from our apartment. I ended up with bronchitis and delivered our daughter on the 28th of December by C-section and her first view of her mother was with me wearing a mask. I haven't had anything huge happen, like knocking over the town Christmas display but I have had a turkey that took like 10 hours to cook, it must have been frozen but I thought it had thawed all the way through. Not exactly a mishap, but on Christmas Day, 2004 it snowed here in south Louisiana. It NEVER snowed before on Christmas Day. We see snow maybe once every decade. And usually it is gone by noon. So it was very unusual to say the least to have a White Christmas here in Louisiana. Of coarse, that following summer we had hurricane Katrina. Now that was a mishap of major proportion. I had a terrible Christmas once but it is too depressing. Fortunately Christmas can only be better. We've had a few holiday misunderstandings - but when you blend two religious traditions that is bound to happen. After 35 years, we either smoothed it over or just ignore it - after all it is only one day. Would really like to try this series.